Replacing Baby Jake — Suggestions, please! A bike is a really personal thing. It’s a machine, but because you’re using your body to power the machine, there’s a unique synergy and relationship (unlike driving a car). It may not happen every ride, but that feeling of oneness between you and the bike is pretty amazing. Baby Jake was the first new bike I ever bought (excluding my Wal-Mart bike in college, cringe; I won BUB), and I quickly turned the cyclocross bike into a great urban commuter. For about a year, Baby Jake and I spent [almost] every work day together — six miles there, six miles back. When I took my car commute job at the end of 2009, our time together was relegated to errands on the weekends and some evening outings. Once Gabriel came along, Baby Jake became my trailer puller, but once I got the IBert front seat (which didn’t work on Jake’s frame), I returned to BUB for many rides. Last Monday, the bike shop declared Baby Jake totaled, due to a bent frame. It was really hard to photograph the damage, but with the naked eye, it was clear that, at the very least, I would be replacing the fork, front chain ring, bottom bracket and crank, front wheel and tire (and fender), and possibly the rear shifter. These parts may have added up to the cost of a new bike, in and of themselves, but the bent frame sealed the deal. Today, I received the check from the insurance company [of the driver who hit us] for Baby Jake’s replacement. So now the question is, what to buy??? The 2014 and 2015 Kona Jakes are a bit different than my 2009 version; most obviously, they have disc brakes rather than rim brakes. They also lack the dual brake levers I enjoyed on Baby Jake (two sets of brake levers, one for a more upright riding position and one in the drops). So, do I stick with the tried and true and buy another Kona Jake? Or do I use this as an opportunity to try something a bit different? Since I purchased Baby Jake, my eyes have been opened to the world of bikes out there, and I’m not 100% set on going with the exact same thing. Pros: Drop bar (which I like in the Jake); should be a comfortable, reliable bike for commuting — maybe more comfortable than a ‘cross bike? Cons: The Sutra is $300-$400 more than the Jake; not crazy about bar end shifters for urban riding (lots more shifting than you would do when “touring,” due to frequent stops and starts) — could I swap for STI shifters? The Novara Safari at REI also caught my eye yesterday, though I’m not crazy about the twist-grip shifting. Cons: I don’t really know much about folding bikes — would I really want this for my primary bike??? Also, once designed to my specs, this would probably end up costing significantly more than the Kona Jake. I do like having at least one “fast” bike with drop bars (but still sturdy for commuting), so I’m not sure what other options there are, but I’m open to suggestions . . . .
10 Responses to Replacing Baby Jake — Suggestions, please! I asked one of my favorite people for bike reviews. They just did Bike Across Kansas and I think one or both have Salsas. I’ve heard great things about the Surly Crosscheck, and I can’t stop looking at the Linus Libertine, if straight across top tube is an option (tho my road bike has down tube shifters and I do not love that). 8-speed may not be enough gears? I do sorta wish I had gotten 8 vs 3 on my Linus, but honestly, I only ever care in the county on the big hills. Thanks, Rebecca. Matthew’s really happy with his Salsa Casserole (that name, though!). I’ll add the Crosscheck to my list of Surly bikes to check out. That Linus bike IS lovely, but I’d prefer to avoid the down tube shifters, and I’m not sure about 8 speeds being enough. The 11 gears on the internal hub on Big Blue seem to work well — not sure I’d want less than that. Ha! Do you like Casserole better than Edgerunner? 😉 Full review from my friend Craig in new comment at end of this section. I’ve heard that steel is a much smoother ride than aluminum – not sure how true that is especially for relatively short distances. I too am a fan of drop handle bars, mine don’t have dual break levers but I generally ride on the hoods and I can reach over to grab the breaks easily. If I’m screamin’ down a big hill or something though, I definitely go into the drops for better breaking and more control. A folding bike would scare me to death. I’m sure there must be some “fool proof” way to protect against this, but I’d be terrified that it would fold up on me while riding. Plus, they usually have pretty small wheels, which means you’re gonna feel every bump on the road. 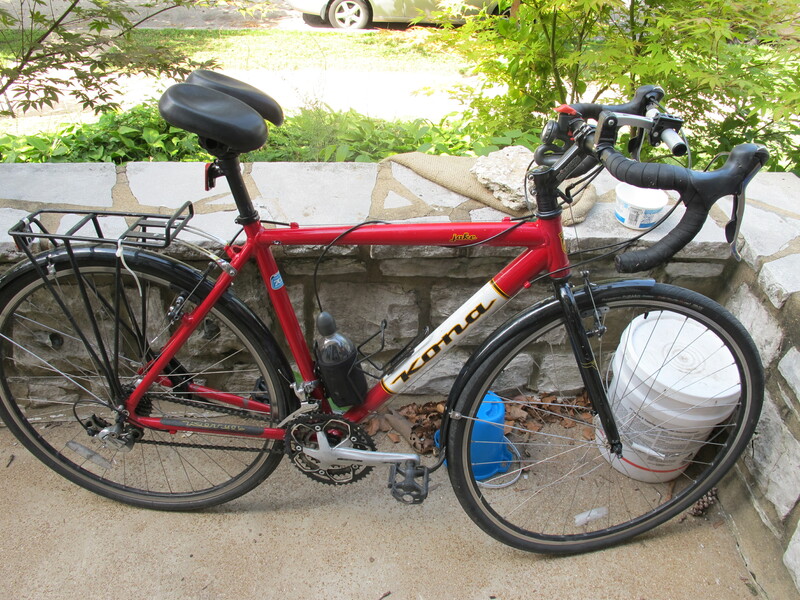 When I bought my Ruby I decided that frame geometry and weight were the most important considerations – of course hauling stuff on her is not part of the plan, so that didn’t figure into my thinking. I dunno… if it were me I’d go test ride a bunch of bikes and see if anything stands out. Since you do have Bub and the longtail it’s not like you’re completely without a bike, so you can take your time a bit and hopefully find just what you want. Plus… there will be great sales the deeper you get into fall! Good luck with it. The two bikes I currently ride are steel and I find them very comfortable. I haven’t had my aluminum MTB upgraded for fit or commuting yet. “I have a Salsa Vaya, and it is the best bike EVAR. “I looked into a ton of commuter and touring bikes before I got it. The Surly Long Haul Trucker can haul a lot, but was described as not feeling very fast due to its head tube angle. The Surly Crosscheck was in the hunt too, but the top tube was a bit high for the size I wanted. I also looked at the Kona Jake – there was an awesome matte orange color last year that I loved. Again, the fit was a bit off. “So, I got the Salsa. “The top tube drops down pretty far at the seat tube, so there is plenty of standover height. It has a tall steering tube, so the handlebars come up pretty high. This leads to a more upright riding position that puts less pressure on your hands. It has disc brakes, which are great on the downhills. The tire size is a bit wide, which is less efficient than super narrow road tires, but provide more cushion during commutes. Also, drop bars. “I have a sweet carbon Specialized Roubaix with Ultegra everything. I also have the Vaya with mid-grade SRAM components. If I had to ride from here down to LA right now? I would take the Vaya in a hot second. If I had to ride to work right now? The Vaya. If I had to ride up the damn mountains in this town? Vaya, with its lower gearing. I really just ride my Specialized during our fast, flat road rides on the weekends with our friends. If I could only keep one bike the Roubaix would be gone. Rivendell Betty Foy is loved by many, also Sam Hillborne? Not sure what your friend has, but if I’m trying to stick to not [much] more than the replacement cost of the Jake, then I’m looking at the lowest end build. I’ll see how the components of that compare to the other bikes I’m considering — so much to think about!